Congratulations to @natalagolamoon, @beautifulxscape and @_Juuuuishoney! 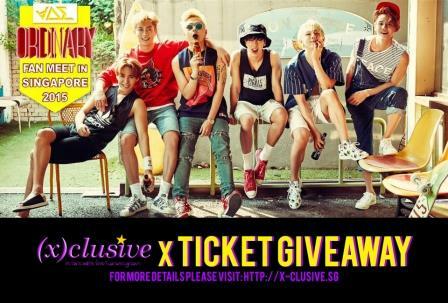 You’ve won yourself a pair of tickets each to BEAST ‘Ordinary’ Fanmeet in Singapore 2015! Do drop an email with your Full Name, NRIC Number and Contact Number to sgxclusive@gmail.com by 2359h today else we’ll pick another winner. Calling all B2UTYs! We’ve got some good news for you. (x)clusive will be giving away THREE pairs of tickets for you to catch BEAST ‘Ordinary’ Fanmeet in Singapore 2015 much thanks to the organizer, Three Angles Production. 1) Follow us on Twitter (@sgXCLUSIVE) and Facebook (https://www.facebook.com/sgXCLUSIVE). 2) Share this post on Twitter and/or Facebook (using our sharing links at the top/bottom of this post) – each tweet/share earns you one chance! Please do take note to tweet/share them publicly for it to count. 3) Fill in the form below and tell us “What is your favourite BEAST song and why?”, along with your shared URL(s). Contest will end on 21st September 2015, 2359h and all winners will be announced on 22nd September 2015 on this post, so be sure to check back. Winners will have to email us your Full Name, NRIC, Contact Number and E-mail to receive the prize. There is no restriction on who can participate in this contest (even overseas B2UTYs) as long as you can confirm you attendance to the fanmeet on 24th September 2015. No multiple entries are allowed, so do fill in the form only ONCE, though you can submit multiple URLs in that one entry. THREE lucky winners with the most interesting answer will be chosen. Good luck to all fans participating! (x)clusive is proud to be the Supporting Online Media for BEAST ‘Ordinary’ Fanmeet in Singapore 2015! Hope I really can win the ticket. I really want to see the boys ㅜㅜ miss them so much. i hope to win the tickets since i tried every single way. thank you for holding up the giveaway! Hi, thanks for having this giveaway! Hope I can win this time round! Have tried other giveaways from other social media but to no avail. Hope to see dujun on HARI RAYA! My favourite Beast song is Back to you. This song was never feature in live but whenever I hear the song I will feel the boys feeling in reaching to their Beauty. Always remember that we are always with them no matter what happen to them. I really hope that i can win this ticket to watch the b2st concert.I really love them hoping to see them perform here in Singapore live on the 24th Sep. Please give me a chance to win…….